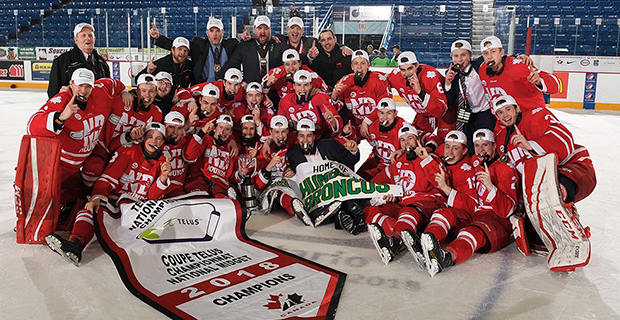 In one of the most dominant runs in recent memory, the Notre Dame Hounds won the TELUS Cup after going unbeaten in both the round robin and knockout stage. In the final, the Hounds were propelled to victory by a dominant second period, as well as a strong goaltending display. After the first period in which Magog had outshot Notre Dame 12-5, the Hounds held a 1-0 lead thanks to a goal from Zach Plucinski. In the second, Notre Dame added three more goals, two on the powerplay and outshot the Cantonniers 14-5. Magog got on the board early in the third and continued to direct plenty of shots on net, but Aaron Randazzo was brilliant, stopping 29 of 30 in the game. Luke Mylymok had a hat trick and four points, while Nolan Renwick had three helpers in the victory. It was the fifth national championship in team history, making them the all-time winningest squad. The Hounds have now won 22 straight at the Midget National Championship. Plus, Notre Dame were unbeaten in the postseason, from their Saskatchewan playoffs until now – an astonishing 20-0 mark. In the semifinals, both games were very close. Notre Dame beat Toronto 3-2 despite outshooting them 36-19. Mylymok had two goals including the game winner. The other game saw Lethbridge taking on Magog and it needed extra time to end. After Zack Stringer scored with just under two minutes left to tie the game and force overtime, Jeremy Lapointe netted the winner seven minutes into the fourth period to propel Magog to the finals. Toronto and Lethbridge clashed for bronze, but the Young Nationals couldn’t get any offence going against the Hurricanes. Carl Tetachuk had 20 saves for a shutout in the 4-0 win in a game that was chippy, as evidenced by the seven powerplays for each team. Kadyn Chabot scored twice for Lethbridge. Mylymok finished as the leading scorer in the tournament with nine goals and 13 points, ahead of Lethbridge’s Stringer (seven goals, 11 points). Randazzo from the Hounds allowed just four goals in four appearances and had a 1.00 GAA and .957 save percentage, ranking atop the stats. Next year, the TELUS Cup will be hosted in Thunder Bay.